It's bad news for people that followed "Rosario Tijeras" on Univision as it has been confirmed that it will soon stop airing on the network. According to NovelaLounge, the series is moving to UniMás starting Monday, August 7 and it will occupy the 9pm/8c timeslot, replacing the second hour of "Totalmente Diva." The news is not surprising as the Spanish-language net had been promoting the premiere of "La Tierra Prometida" for the 10pm/9c slot. 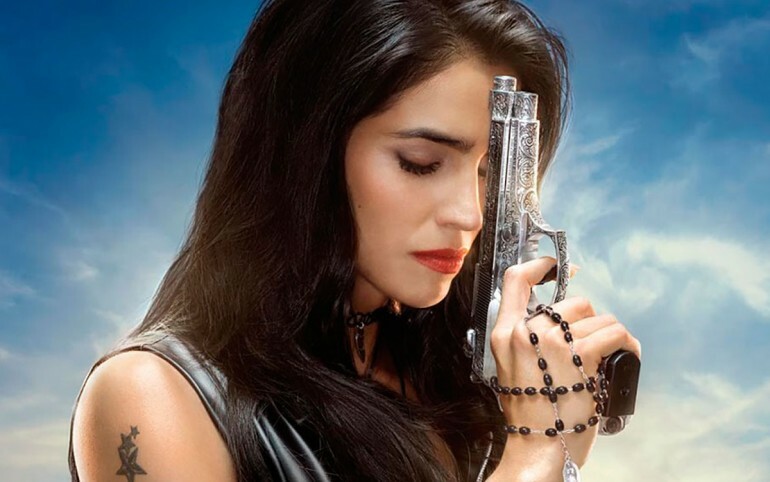 The TV Azteca production that starred Bárbara de Regil has struggled to gain traction and faced off the fifth season of "El Señor de los Cielos" that is still a ratings hit considering it's an aging franchise. Fans of "Rosario Tijeras" can at least feel relieved that it wasn't completely cut and not living up to it's title. "La Tierra Prometida" is a big bet from Univision and it's counting on it to be a hit following the great numbers "José De Egipto" had at the network. The Brazilian production is a sequel to "Moisés y Los 10 Mandamientos" that was also a big ratings success on sister network UniMás. "La Tierra Prometida" beings after Moses’ death, Joshua is the new leader of the Hebrews. He is an experienced warrior, gifted with courage, determination and a powerful faith. But it is no easy task to lead the people to its new destination. With his closest and trusted allies, Joshua must fulfill a difficult mission ordered by God: to command the twelve tribes of Israel in their conquest of Canaan, the promised land. The first great confrontation of Israel will be against the fortified kingdom of Jericho. In sequence, Joshua and his allies will have to battle innumerous other times, against the kingdoms of Ai, Gibeon, Jerusalem and Hazor. He will also live a thrilling love story with the beautiful Aruna, a courageous and determined young lady, skillful with a sword and capable of fighting alongside men soldiers when necessary. The problem is, Aruna’s sister, feisty Samara, is also in love with Joshua. With her treacherous mother as an accomplice, Samara will do everything to separate the main couple. This love triangle will create a great dilemma in Joshua’s life. After exterminating their enemies, the Hebrews will reach the Promised Land, and Joshua will divide the lands of Canaan amongst the twelve tribes, fulfilling the will of Israel’s God. “The Promised Land” is a soap opera filled with conflict, intrigue, romance, adventure, power struggle, betrayal, forbidden passion and impossible love. All of this told with much emotion, leaving the public with a great message: that nothing is impossible for those who put their true faith in the Lord. Sidney Sampaio stars as Joshua who after Moses’ death, becomes the spiritual and military leader of the Hebrews, and commands them in their conquest of the Promised Land. He is an experienced warrior, gifted with courage, determination and a powerful faith. He is Ana’s widower, and he intended to remain lonely for the rest of his life, but falls in love with the beautiful and brave ARAUNAH. His relationship with her causes the villain SAMARA to hate them. She is obsessively in love with JOSHUA, so she feels rejected and swears to take revenge. Is 'Rosario Tijeras' On Univision A Flop? What Is 'La Tierra Prometida' Univision Telenovela About? What Is 'José De Egipto' Telenovela About?